I told them I was doing research for a future purchase. They still spent time with me and answered all my questions without making me feel like I was bothering them. When I am ready to buy this will be the first place I come to make a purchase. Very good, I like the way always take care of the service on my truck. 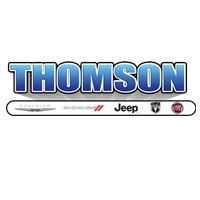 I just had some warranty work done on my Jeep Grand Cherokee SRT at Thomson Chrysler Dodge Jeep. It was my first trip over there. Andrea and the team provided the best experience I've ever had at a dealership. Great communication & service. I won't go anywhere else. I called this dealership and talked to a girl named Madison. She was so kind and answered all of my questions for me to the best of her extent! I will Be recommending this place to my friends. Getting my little Jeep service here was a lot better than Milton Ruben store.